This a continuation of Part 1. Read Part 3. The California legislature passed a number of bills effective 1/1/2014 affecting California employers. 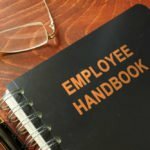 Certain of these new employment and labor laws require the prudent employer to update their employee handbooks. In law school budding lawyers learn a buzz phrase – “oh, that’s hornbook law” (aka “black letter law”). A “hornbook” is like “Cliff’s Notes” for law students and states the most rudimentary and basic recitation of the law so even a novice law student can figure it out. “Handbook” law is not “hornbook law” by any stretch of the imagination.